Up and down California’s Central Coast and all through Paso Robles Wine Country, spring has sprung. A quick trip to any of the Farmers Markets from San Luis Obispo, Templeton, and Paso Robles reveals an incredible bounty of farm fresh seasonal vegetables. Two local favorites on the Central Coast—and throughout California—are artichokes and asparagus, but while these vegetables are a delicious reminder of the season, both are notoriously difficult to pair with wine, but with a few tips, you’ll soon be enjoying your Paso Robles Wine Club selections along with your favorite spring vegetables. Few foods are more difficult to pair with wine than artichokes or asparagus. 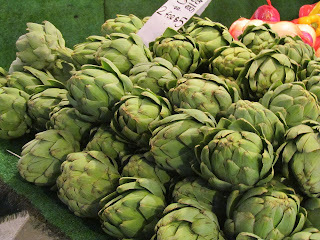 Artichokes contain a chemical acid called ‘cynarin’ which makes them taste sweeter—especially when paired with wine and asparagus has abundant sulfur compounds (most vegetables do, just not in such high quantities) which can create havoc on the palate, giving off a metallic and vegetal taste that is only magnified by most wines. Change the flavor profile: Sometimes the best way to overcome a challenge is to change the obstacle. Pairing wines with artichokes or asparagus is difficult because they taste so green, or vegetal, but by grilling, charring, or caramelizing them instead of going with the more traditional steamed or raw preparations, you increase the number of wines that will pair well with them. Add salt and fat: Never bad culinary advice on its own, adding fat and salt to artichokes and asparagus tones down the overtly vegetal profile and makes them vastly more pair able, not to mention infinitely tastier. So, go ahead and add a Hollandaise sauce to that asparagus or stuff that artichoke with breadcrumbs, cheese, and prosciutto and then open a creamy Chardonnay and enjoy! Pair Like with Like: A fairly no-fail technique is to pair like flavors with like flavors. For example, pairing a crisp white wine with high acid foods, green wines with green wines, and sweet wines with sweet wines. Enjoy the bounty of the season, along with the very bestwines of Paso Robles. Our wine club is the perfect accompaniment to any trip to the Farmers Market. The Paso Robles Wine Club is free to join and will allow you to enjoy unique and boutique Paso Robles and Central Coast wines delivered right to your door. Now that’s something to celebrate this season.